How to Prosper, Survive, or Die Under Godfather Management: A Guide For New Hires by Leo Bartlett is an engaging read that tackles the topic of Godfather Management and will help in furthering the career goals of employees. The strategies and techniques in the book will guide readers on how to avoid the early pitfalls of Godfather Management so that they can become more successful and effective when it comes to reaching career goals. There are many ways to prosper under Godfather controlling tactics and reading this book will help new hires identify issues and resolve them so that they know how to handle and rectify the situation or leave the job. It is a handy tool that will help readers to survive Godfather Management, enjoy the journey and the job by maximizing their potential. The author’s approach to a relevant topic is extensive and the various strategies are helpful to readers and will assist them in changing their approach with their boss. The book is useful when it comes to handling the boss effectively or deciding when to leave the job. The tips for staying are both effective and successful, and will aid readers on how to accomplish the goals of the organization. There are many points to ponder that can be incorporated into one's working style and these are helpful when it comes to understanding what motivates Godfathers and drives their behaviors. The book will help readers to break free from the fear of Godfathers and grow well under a Godfather Manager. The examples shared in this book help to make the concept clear to readers and the survival techniques mentioned will be useful when it comes to handling stress and deadlines in the workplace. How to Prosper, Survive or Die Under Godfather Management: A Guide for New Hires is written by Leo Bartlett. Different styles of management work for different employees. Godfather Management is one of those styles. This style of management is mainly founded on the use of position power and strict adherence to laid down procedure to achieve the needed results from subordinates. The manager who relies on their power is motivated by feeding their ego while the one who relies on procedure thrives on seeing things done right for the organization. Either way, this type of management often results in low motivation among the employees, poor productivity and high turnover. While some employees might thrive under such management, others might not - and even for those who thrive, it is often short-lived and they soon give in to the need to control their own career path. Should you find yourself under such a manager, what do you do? This book is meant to prepare you for such a working environment. The reality is, whether you like Godfather Management or not, as an employee the ball is not in your court. Most times you do not get to choose your supervisor, especially when you are just starting out. As such, you must learn to work with the one you are given. So how do you work under a Godfather Management style supervisor without letting them stifle your career growth? In How to Prosper, Survive or Die Under Godfather Management: A Guide for New Hires, Leo Bartlett shares knowledge and advice on Godfather Management. The advice and tips in this book will prepare you for a career in a Godfather Management environment and for a future as a manager yourself. How to Prosper, Survive or Die Under Godfather Management: A Guide for New Hires by Leo Bartlett talks about what Godfather Management really means and how employees need to adjust or adapt to their rules to survive. Leo Bartlett talks about how to learn how the boss rules and that you should show them your loyalty. He shows how huge companies earn trust and how they handle people who aren’t loyal to them. He also has a quiz for you to take to see what kind of a person you are and what type of job you’d be good at. 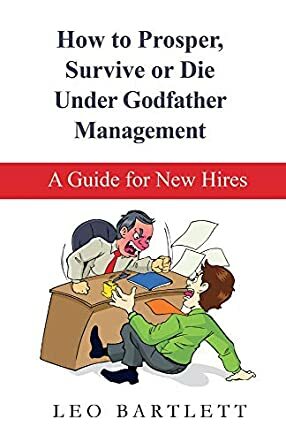 How to Prosper, Survive or Die Under Godfather Management: A Guide for New Hires by Leo Bartlett puts forward a very interesting concept. I realized I had worked for two bosses under this category, I just had no idea it had a term to it. I wish I had known all this back then. I liked how Leo Bartlett used poems and even a novel to describe things. He gives you a quiz to take and gives you the definitions to each category type, so you can see what kind of person you are. I have to admit, I was a bit confused on how to take the quiz. However, I found this book to be very informative, and it made me very happy that I’m not working in that world anymore. This should be a definite read for the younger generation who would like to work in the corporate world.